Issue 34 focuses on a few main features including SteamWorld Dig 2, the April 12th Nintendo Direct, and a retrospective on the Zelda series. 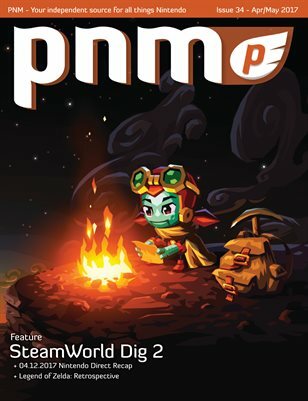 We had the pleasure of interviewing the fine folks at Image & Form Games about SteamWorld Dig 2 and they provided some new story elements and gameplay details. If you look closely at the cover, you might actually spot a hidden story element. Let us know if you spot it! Nintendo also held their first Direct since the Nintendo Switch launched on March 3rd. We have the full scoop on all the 3DS and Switch game announcements from the show including the latest about ARMS and Splatoon 2. And finally, our staff looks back on the Zelda series as we reminisce about our franchise highlights from the last 30+ years. As always, check out some cool concept art and all the latest reviews! Happy Gaming!